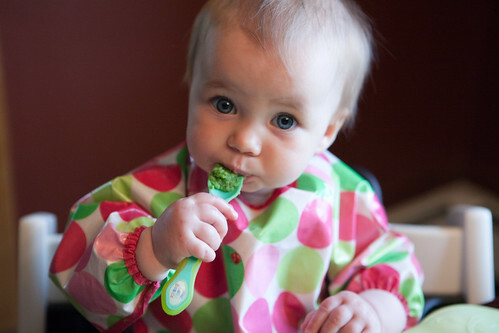 To start teaching your baby that homemade foods are enjoyable, and the easiest choice. To save money. If a jar of baby food is $1.50, and you go through even 1 per day from ages 6 months – 12 months, that’s about $270. To allow your baby to eat a greater variety of food. Do you see baby avocado or baby buffalo on the shelf? Thought not! To avoid additives and preservatives. Some of the store-bought baby food no longer contains these, but you still have to read the labels. I recently accidentally purchased 6mo+ “Organic Blueberry Dessert” thinking it was prunes. It contained many ingredients that I would not want a 6 month old to eat, including added sugars & dairy. You can mix homemade baby food with breast milk or formula, instead of water. This adds extra nutrition as well as giving baby a taste they are familiar with. Another major benefit of making your own baby food is to help make the change from pureed to mashed foods easier. Even higher “stages” of store bought baby food are quite mushy and pureed. It is far easier to add texture to your own baby food. Simply blend less and add less fluid to gradually increase the lumpiness of the food. Soon you won’t need the blender at all, and can just use a fork (i.e. to mash beans, canned salmon etc). There is a “window of opportunity,” around 9 months of age, in which it will be much easier for your baby to learn to accept different textures. Learning how to chew does take time and practice – be patient! Use a proper chair and small spoons, in a relaxed atmosphere with no distractions to feed your baby. Some babies may prefer to use their hands, and this is ok! Your child will make a mess playing, and poking at their food, so be prepared and enjoy this exploration. 1) Prepare: wash and peel fruits and veggies with tougher skin. Soon you will be able to leave peels on fruits like pears and apples, to add more texture to the food. Rinse canned beans. Trim fat from meat. 2) Cook: I like to boil meat to add more moisture. Steam fruits and veggies in a steamer basket on the stove or in the microwave as opposed to boiling, to retain vitamins. 3) Puree: in a blender, food processor or hand mill. Add breast milk or water – the more fluid you add, the finer the puree will be. 4) Portion into your Wean Green cubes and freeze! This entry was written by Melissa, posted on November 16, 2011 at 6:36 am, filed under Baby Foods, Wean Team and tagged baby food, homemade, Introducing Solids. Bookmark the permalink. Follow any comments here with the RSS feed for this post. Comments are closed, but you can leave a trackback: Trackback URL.